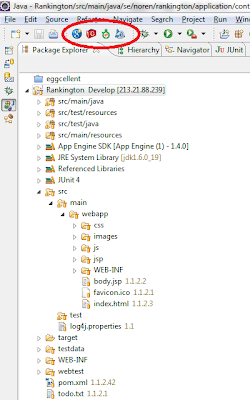 There is integration with Google App Engine for several IDEs and you can also interact with the deployment tools from plain command line if you have that disposition. I'm an Eclipse guy, and here's how I've done to get a good setup to be able to develop in an efficient way using Eclipsen, Maven, CVS, Hudson and GAE. Fisrt of all, install the Google App Engine SDK from http://code.google.com/intl/sv-SE/appengine/docs/java/tools/eclipse.html and follow the install instructions. You should get a new toolbar in Eclipse with icons for creating GAE web projects, profiling them and for deploying to the cloud. If you create a new GAE application you can have it deployed in Googles data centers in a few minutes. All you need is a standard Google Account. You access your application at http://localhost:8888/ by default. In your dev environment a light weight data store will be kept in WEB-INF\appengine-generated\local_db.bin. This store is permanent over server restarts and must be deleted if you wish a clean state. Indicies are automatically generated in WEB-INF\appengine-generated\datastore-indexes-auto.xml. You access the development console at http://localhost:8888/_ah/admin where you can inspect and make queries on the data store and work with task queues and more. If you wish to complicate your environment with some continous integration for compilation, bug, test and coverage reporting I'll outline how you could integrate your GAE application with Hudson. I've fiddled around with the default directory structure to make a more Maven compliant tree for dependency management. That is no problem since the App Engine plugin uses the Eclipse .classpath to resolve the structure. 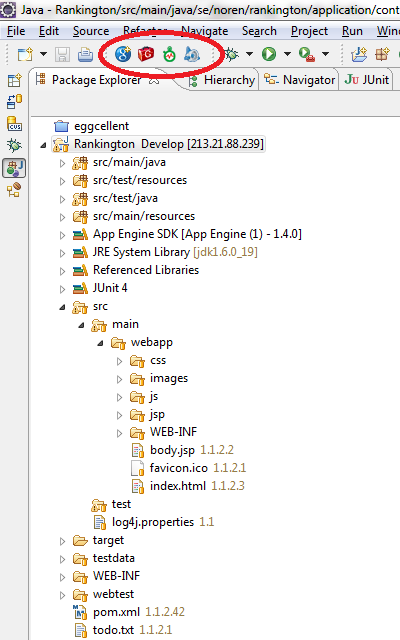 So create src/main/java src/main/resources /src/test/java src/test/resources and src/main/webapp. Create a pom.xml in your project root and setup your Maven dependencies. To make this easy, install the Eclipse Maven plugin which makes pom-editing a no-brainer. You will need a few special dependencies for App Engine. Be careful about which version of the plugin you use to match the Maven dependency. So once alright in Eclipse, commit your application to a version control system. I use CVS, but this will work fine with Subversion as well. In the example below I commited App Engine project Rankington on branch Develop. This will generate a directory structure with your compiled classes, a packaged war-file ready for deployment to Google App Engine, directories with reports of your unit tests, static code analysis bug possibilities and code coverage. Next time we'll look at how to integrate this into Hudson.